Preheat the oven to 220°C, gas mark 7. Prick the potatoes with a fork, place on a plate and microwave on high (900W)for 3 minutes. Turn them over and microwave for a further 3 minutes. Transfer the potatoes to a baking sheet and brush with the oil. Season and bake in the oven for 20 minutes. Meanwhile, place the bacon on a separate baking sheet and cook with the potatoes in the oven for 6–8 minutes. Crumble the bacon and mix into the cottage cheese with the remaining ingredients; season. Once the potatoes are cooked, cut them open, add the topping and serve. 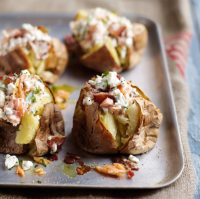 For fast jacket potatoes, start them in the microwave, then finish in the oven to guarantee that all-important crisp skin.